Tani's father is happy he gets the freedom to worship and watch his son pursue his dreams in America. Tanitoluwa Adewumi, who goes by Tani, placed first in the New York State Scholastic Championships, beating out competitors from elite private schools. Incredibly, Tani only began learning chess about a year ago after his family left northern Nigeria in 2017 to escape Boko Haram's attacks on Christians. Tani, his parents, and siblings moved into a homeless shelter when they arrived in America and have been homeless ever since. Despite this, he tells the New York Times, "I want to be the youngest grandmaster." Tani attends Manhattan's P.S. 116 elementary school and joined the chess club. His teacher waived the costly chess club fees after seeing Tani's talent. 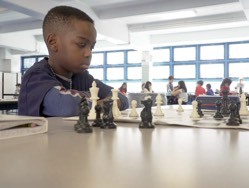 Russell Makofsky, who oversees the school's chess program, told USA TODAY he is astonished by the eight-year-old's quick success. "It's unheard of for any kid, let alone one in a homeless shelter," he said. Before the competition, Tani's mother took him to free practice sessions in Harlem and allowed him to practice the game online. Now, he's preparing for the elementary national championship in May and spends hours on the homeless shelter floor practicing. Meanwhile, his parents are working just as hard. Tani's father rents a car that he uses to drive Uber, and he recently became a licensed real estate salesman. His mother is learning English and just passed a course to become an in-home health aide. Through it all, Tani's family is still navigating the immigration system and a hearing for their asylum request is scheduled for August. But Tani's father is happy he gets the freedom to worship and watch his son pursue his dreams in America. "The US is a dream country," his dad told the Times. "Thank God I live in the greatest city in the world, which is New York, New York." After the Times shared Tani's story, thousands of people gave donations, raising more than $14,000 to help his family get a home. Meanwhile, the Nigerian Christians who did not get a chance to flee their country are being slaughtered. Boko Haram has claimed more than 120 lives since February alone and has gained notoriety as one of the deadliest terror groups in the world. According to the nonprofit group Christian Solidarity Worldwide (CSW), 52 people were killed and 100 homes were destroyed last Monday in the latest attacks on Inkirimi and Dogonnoma villages in Maro, Kajuru Local Government Area (LGA). The victims included women and children. CSW's Chief Executive Mervyn Thomas urged Nigeria's state and federal governments to end the violence. "The relentless death and destruction is a sad indictment of the continuing failure by both levels of government to fulfill the primary mandate of protecting all its citizens impartially," he said in a statement.